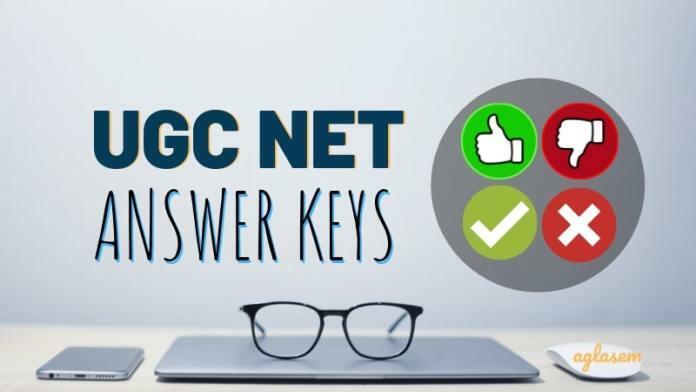 UGC NET Answer Key June 2019 – Get here answer keys of UGC NET of 20, 21, 24, 25, 26, 27, 28 June 2019 for all shifts after exam. The answer keys contain correct answers of all questions asked in Paper I and II. Candidates can thus calculate marks in National Eligibility using UGC NET Answer Key. Also, declaration of result of UGC NET is on basis of final official answer key by NTA from ntanet.nic.in. Get here complete details of UGC NET Answer Key June 2019 for all days and all shifts including official answer key, response sheet, challenges. The UGC NET answer keys published on same day as exam are compiled by teachers and coaching centers are unofficial. Whereas, UGC NET Answer Key by National Testing Agency (NTA) is official. Check following timeline to understand their availability. After checking answers, you can take a look at UGC NET Cut Offs to get an idea of qualifying status. The UGC NET June 2019 is conducted throughout the country as per above schedule through computer based test mode in which 9.5 lakh candidates registered. The unofficial and official display of UGC NET question papers, answer keys and responses attempted are displayed online. Links to check day wise UGC NET 2019 Question Papers, Answer Keys are in table below. Release Date: The first time that NTA conducted UGC NET exam, the exams took place from 18-22 December. NTA released answer key on 29 December, that is exactly one week after last date of exam. Therefore this time it is expected that UGC NET June Answer Key 2019 will be released by NTA around 5 July 2019. Check here: Candidates can check official UGC NET Answer Key June 2019 from ntanet.nic.in. Overall duration of the exam is 3 hours. There is no break between the two papers. As per the new syllabus of UGC NET exam, Paper 1 is General Paper on Teaching and Research Aptitude. It consists of generic nature questions that test your teaching and research aptitude. They are on reasoning ability, comprehension, divergent thinking and general awareness. By the same token, UGC NET 2019 Answer Key of Paper 1 contains questions with answers, solutions of 50 questions worth 100 marks. You can get paper 1 answer keys from day wise links above. In UGC NET, the second paper is Paper 2 that is specific to subject chosen. There are 81 subjects as listed below. One you chose is also given in your admit card of UGC NET 2019. Subject wise answer key links can also be accessed from here. UGC NET 2019 Answer Key of Paper 2 contains questions with answers, solutions of 100 questions worth 200 marks. How to use UGC NET Answer Key 2019? There are two big reasons behind uploading answer key of UGC NET exam. #1. Candidates can know the correct answers using UGC NET Answer Key. This assists them in calculating marks out of 100 in Paper 1, and out of 200 in Paper 2. #2. Issuance of official NTA UGC NET Answer Key creates transparency. Since NTA officially releases question paper, answer key, responses it makes the exam conducting process transparent. This is because candidates get to have a say in the process and this further ensures error free paper and keys. For the first cause, you can go through UGC NET 2019 Answer Key and calculate your score using marking scheme knowledge. Marks in UGC NET = (Number of correct answers in Paper 1 * 1) + (Number of correct answers in Paper 2* 1). Use the UGC NET marks calculator below to calculate your score. Anyone who has appeared in NET exam can therefore get an idea of their expected score using the answer keys and predict chances of qualifying exam. Comparing marks obtained with cut off of UGC NET gives you chances of clearing the exam. Here is last time’s UGC NET Cut Off. How to get official UGC NET Answer Key by NTA? You can download official answer key of UGC NET June 2019 from ntanet.nic.in for a limited period of time. This is because the exam conducting body activates a login link to download question paper, answer key, responses at ntanet.nic.in for a given duration. You can download them by watching following video or going through steps given below. Step 1 – Visit official website ntanet.nic.in. Once at the website, you can locate the link to download NET June 2019 Question Paper, Answer Key, Responses. There is also a separate link for challenges regarding answer keys. Next, click the one you intend to go through. Step 2 – Opt for one login option. You can either login through application number and password or application number and date of birth. Then depending upon which option you chose, you will get the next login screen. Now if you have chosen login through application number and date of birth, then those are the two things you need to login with. Otherwise if you chose to login using application number and password, then you need to login with them. This step may appear confusing to some candidates. Let me explain. So when you login, you see two things in your dashboard – one is about challenging answer key, and another is to see your questions and responses. Right click and open both in new tabs (we recommend you check answer keys in your computer rather than mobile!). Opened? Good! Now you have to come to your question paper and see the question ID, marked response option ID. Then go to answer key challenge page and see what is the correct answer ID. If your chosen answer ID matches with that in answer key, then you get 2 marks for the correct answer, otherwise you can see the correct answer. This brings us to the next thing – Challenging answer key! How to challenge UGC NET 2019 Answer Key? In order to challenge answer key, you have to go through steps 1-4 given above. Then, go through these steps. Open that as given in step 4 above. Here, go to that question of which you think answer is wrongly given. Then select the option you think is correct. You need to pay Rs 1000 per challenged question. Please make this fee payment using mode available. That’s it! This is how you can check your official answer key and also challenge them. If you face any issues, then please feel free to comment below! By chance if you do not qualify NET June 2019, do not worry, you can fill online form for UGC NET 2019 II. Once the answer key in your hand, you may be wondering about UGC NET 2019 Result. Do not worry, you can check it as per schedule at official website ntanet.nic.in. In fact there are high chances that result comes even before scheduled date because last time NTA announced result 5 days early. Besides ntanet.nic.in, the official website of NTA that is nta.ac.in also hosts details about ongoing NTA exam events that include UGC NET results. NTA held UGC NET for the first time in Dec 2018. In that exam, following statistics were revealed. If you found this article on UGC NET June Answer Key 2019 useful, please share it. If you have any queries on UGC NET Answer Key 2019, please ask in comments below. Thank you. And best of luck for your result!